What is the difference between single-stage, two-stage and variable-capacity heat pumps and air conditioners? The differences are explained in detail below, but here is a summary. In general, as performance goes up, cost and efficiency go up. The cost to run the AC or heat pump go down. This table summarizes the details. Best: Variable-capacity (also variable-speed and modulating) compressors vary capacity from about 40% to 100% in increments of less than 1%. If you’re unfamiliar with the operation and performance of the three types of heat pumps and ACs, it is explained in our Central Air Conditioner Buying Guide here. Now, let’s talk about how the pros and cons of each compressor type. Compressor efficiency is determined by how much cooling or heating is achieved with a set amount of energy. If that sounds like gas mileage, it should. The concepts are the same. SEER, or seasonal energy efficiency ratio, is the measurement for ACs. The diagram above shows SEER in Basic, Better and Best ranges. HSPF, or heating seasonal performance factor, is the equivalent measurement for heat pump heating. The diagram above shows the Basic/Better/Best SEER ranges achieved by the three compressor types. Here is why they differ. Single stage compressors in ACs and heat pumps have only one speed – 100%. Even if your AC is asked to cool your home one degree, the compressor runs at full capacity. More energy is used than is necessary, and the system might overcool, since it is still running at full speed when the thermostat setting is met and the AC turns off. All the cold air it has already made is pushed into your home. If you’re familiar with cars, you know that each vehicle has an optimal speed to achieve the best gas mileage. It certainly isn’t 100% — driving as fast as the car will go! 1). Single-stage SEER is the lowest. 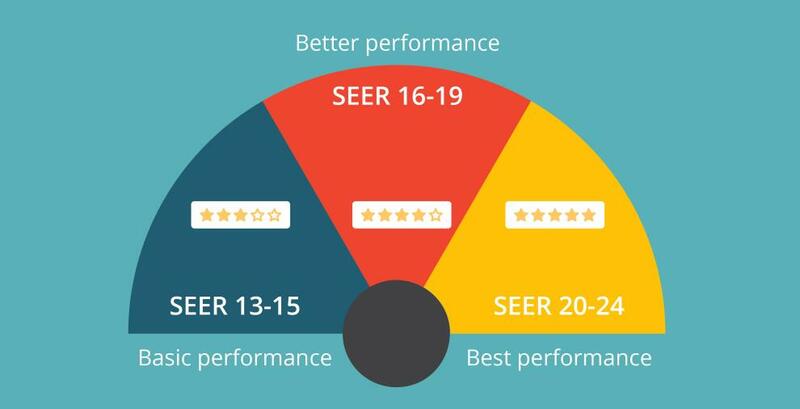 The technology is getting better, so the current SEER range for single-stage ACs and heat pumps is 13 on the low end. The most efficient single-stage air conditioner is the Lennox SL18XC1 with a top rating of 18.5 SEER. 2). Two-stage compressors are more efficient because they run on low most of the time. You’ll get better gas mileage driving 70 than 100, right? Two-stage compressor SEER is in the middle. In current models, it starts at 16 SEER. The most efficient two-stage AC is also a Lennox. The Lennox XC21 has a top rating of 21 SEER, though about 19 SEER is tops for most brands. 3). Variable-capacity compressors are most efficient. Their lowest speed is about 40%. Even if your home needs more air conditioning, it can boost capacity just a few percentage points when needed. This is much more efficient than starting at 70 and speeding up to 100. Variable-speed compressors can run at 100%, of course, but speeds above 75% are only needed on the hottest days. The current SEER range for most variable-capacity compressors is 20-24 SEER, but Lennox again leads the way with the 26 SEER XC25 air conditioner. Wait! Before you decide that a variable-capacity AC or heat pump is always the best, read about their disadvantages too (as listed in the table above). 1). Comfort: Humid air gives you that “clammy” feeling. Drier air is much more comfortable in summer. 2). Health: All that humidity makes it a lot easier for mold to grow – mold in your air ducts, mold in your home and potentially mold in your lungs. If you’ve been tracking with the technology discussed, then it won’t surprise you that humidity control gets better with AC performance. Single-stage cycles are short and powerful (and loud, but that’s discuss below). The blower typically runs at full speed. Humidity in the air doesn’t have time to condense on the indoor coil so it can be drained away. Instead, it is blown back into your home. Two-stage cycles at 70% are longer and gentler. The fan usually runs slower too, to match the compressor output. The longer cycle and slower air speed mean more moisture condenses on the coil and is drained out of the house. Variable-capacity cycles are the longest, and the air speed is the slowest. This is because they are always installed in a furnace or air handler with a variable-speed fan that can run really slow to match the 40% compressor speed. The result is maximum dehumidification. Since drier air is easier to cool, these units also use less energy. Much like with humidity control, the longer a system runs, the better the air quality will be in your home. This is because the air passes through the filter more often and at slower speed, so the filter can trap more dust, debris, and potential allergens. When running a single-stage unit, the “start and stop” of air flow means less air passing through the filter. A two-stage system is a step up, though it fails to meet the air-filtering capabilities of a variable speed system. With the longest running time at a lower speed, the flow of air consistently cycles through the system for the best filtration. This continual air movement also means that hot or cold spots will be reduced or eliminated. An added benefit to clean breathable air. All ACs have insulation designed to reduce noise. However, some inevitably escapes. All ACs are loud when running at high capacity. But the slower an AC can run, the quieter it can be. Operating cost: We’ve mostly covered the third aspect. It’s simple math to see that a 26 SEER AC will use 50% less energy than a 13 SEER model. A 20 SEER unit will use 25% less than a 15 SEER unit. The higher the SEER, the lower the cost to run the heat pump or air conditioner. Initial cost: The simpler the design, the lower the cost. See cost ranges in the table above. Repair cost: What is true of initial cost is true of repair cost. Variable-capacity units are the most complex, and a modulating compressor costs multiple times what a single-stage compressor does. Repair costs go from low to high as performance rises from basic to better to best. The bill for installation was $2,000, and that doesn’t take into consideration the $1,800 for the compressor! He didn’t have to pay the part cost because it was under warranty. Labor costs are not covered under warranty. Did you know that? See our HVAC Warranty Myths Debunked Guide for comprehensive warranty information you should know! If Mr. Davis’s AC was more than 10 years old and out of warranty, the part and labor cost for repairing the unit would be more than half the cost replacing the entire AC. Operating cost: The more efficient your AC is, the less it will cost to run. In warm and hot climates, paying more for an efficient AC pays off. If Gary lives in a cool or cold climate, he won’t use his AC much, and it was a good decision to buy a two-stage, somewhat less efficient model. However, if he lives in the muggy southeast or sizzling southwest, his higher operating costs will eat into the money he saved on his AC. Our Central Air Conditioner Buying Guide has sections that will help you select the right size and SEER AC for your climate. To some extent, efficiency is tied to performance. Warm/Hot Climates: For example, if you want a very efficient AC because you live in Arizona, then your options are two-stage and variable-capacity ACs. Moderate/Cool Climates: However, if you live in a moderate or cool climate, you don’t “need” a high-SEER unit. For you, it comes down to comfort. Do you want to pay more to get better indoor comfort? As is clear, two-stage and variable-speed ACs offer better humidity control, improved air filtration, quieter operation and more balanced temperatures in your home. Upgrading the performance regardless of climate makes sense to some homeowners. Others place a higher priority on saving money on equipment cost. They choose a single-stage AC. We’ve linked to several other PickHVAC guides and articles that should be helpful. Local AC contractors can also answer your questions. Getting estimates and asking those questions in the process is free when you request Free Local Quotes. There is no obligation, just the opportunity to discover which AC type best meets your needs. Thanks for reading. If this guide has been useful, please share it using our social media tabs! And if you have a question or comment, we would love to hear from you. Heat pump/gas heat ? If so, where would I find it ? Sorry, but we plan to update Hybrid system this year. I have a heat pump XL20i with variable speed and thou it’s very efficient it’s very costly to repair, going on it’s 4th summer season coming up the larger variable compressor went out, the part was under warranty (1800 dollars) the labor is estimated to be over 2000 dollars to install. Have decided to back up on technology a bit and go to two stage instead. I am considering replacing my entire system, compressor, evaporator coil and heater/fan. Reason is that the coil has a leak. I have a Trane unit that is 12years old and want to replace with Trane and live in zone 3. When you discuss variable/two stage/single stage systems are you talking about the compressor fan or the air handler fan or both? It is not about fan, just the compressor type. For the fans, most fans no matter indoor or outdoor are multi-stages. After reading your viewpoint, I went for the two stage , XR-17 AC and saved a lot of bucks . When you say you saved a lot of bucks do you mean on the purchase of a two stage vs single or variable? Since it’s a recent purchase I’m thinking your operating savings has yet to be determined. Thanks. What is the difference between a two stage vs a variable system? I am in process of purchasing a new heat pump system. Currently have a single stage heat pump system. Does Trane have different models for a 5T 16S unit, if so which is best ? Are they all aluminum? Wondering if the price difference between 2 stage and variable stage is worth it. And which is the better brand to buy? Ruud or Bryant? You really need to mention the drastic expense difference in the repair costs between the more advanced models. And, most people don’t realize there really isn’t that much savings on electricity. Simple is better and I don’t need a rocket scientist to work on my 23 year old 12 seer trane, in fact, most things I can easily troubleshoot and repair myself. JMO, and I am also one that doesn’t see the need for my refrigerator to have wifi. Thanks for the sharing, Terry. We live near the ocean (about 1200 feet). The salt air shortens the life of the outdoor units. Is it worth spending money on a higher efficiency system that will not last long? Are any of the coastal rated units or treatments (e.g. Infinigard) worth considering? We are attracted to the idea of a closed horizontal loop Geothermal unit with no outdoor unit to corrode, but find very little information on contractor quality or suitability for our SC location. There are tax credits, but it seems most of that is just funneled back to contractor or manufacturer in higher costs, while the homeowner bears the risk of shoddy installation or faulty equipment. Any thoughts? There are several coastal models in Carrier product line. We are going through a similar experience right now and one of our local well-respected places told us they don’t push the ‘coastal’ models because the manufacturer want $2k more. Rather, the company disassembles the unit and sends the coils out to be alodined (? -chemically treated for corrosion) at a cost of $800. Food for thought… I personally don’t have enough experience one way or the other for a recommendation.